Georgian Hotel offers the quintessential Californian experience for visitors looking forward to getting away from the humdrum of daily life. The hotel is part of a historic chain of hotels known as the Santa Monica Luxury Hotels. Located just a block away from the pristine Santa Monica Pier, and facing the placid Palisades Park, this hotel stands out thanks to its vibrant colors. The hotel’s precise address is: 1415 Ocean Avenue, Santa Monica, California 90401, USA. To seize every moment of the Californian experience, you need to step outside the hotel and savor the nearby attractions. Stop by at the famed Santa Monica Beach to experience the warmth of Californians and the exuberance of their beach lifestyle. This experience is incomplete without sampling the five-kilometer stretch of nothing but turquoise blue waters and idyllic beaches, ideal for a host of seaside fun activities. Alternatively, take it easy and enjoy sun-basking on the pier, just don’t forget to carry your sun-screen – sunburns are not the way to spend a vacation. Look out for the Rose Bowl Parade, an event that draws florists from different parts of California. Make your way to the market on Saturdays to shop for fresh fruits. Every first Sunday of the month, locals meet at the Santa Monica Outdoor and Collectible Market. Here, you can find great deals, whether you would like a souvenir or are simply looking for treasures and savory home-made dishes. Third Street Promenade is your go-to location for perfect retail therapy. Santa Monica is pet-friendly, so you will find a host parks and facilities for your canines. Back at the Georgian Hotel, the designers did not leave anything to chance. The vibrant blue color seemingly coheres with the clear skies on most days, ushering you to the beautiful structure in style. The hotel is the epitome of classic works of art, offering accommodation for both the holiday maker and the business traveller. Some of the features that endear this gem on the idyllic coastline include 24-hour room service and business centre, free Wi-Fi as well as concierge services. The Veranda Restaurant serves delectable dishes at both breakfast and lunch, after which you can make your way to the 24-hour Fitness Centre for workout sessions. Valet parking is available at a minimal fee, allowing you to experience excellent customer service from the moment you check in. As a pet-friendly hotel, the hotel looks forward to pampering your pet too (terms and conditions apply). Accommodation at the hotel can best be described in two words: modern and chic. You have the choice of guest rooms and suites, both offering unmatched luxury. There are 84 artsy rooms, perfect for you. The classic guest room is a peaceful haven where you can retreat after a day of exploration. The accessible rooms and suites on the other hand, ensure that physically challenged guests are catered for too. The latter are all complimented by visual aid devices for communication purposes. 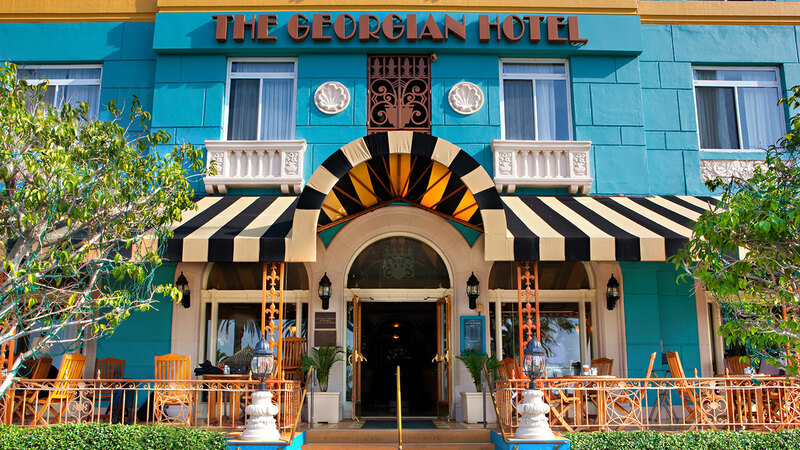 The Georgian Hotel, a recipient of the Tripadvisor Certificate of Excellence 2015, offers prime accommodation with effortlessly chic allure. Stay at this hotel and experience the magic of Santa Monica.